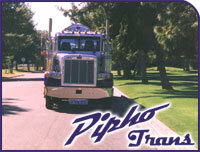 Pipho is a frozen and refrigerated food product carrier and bulk milk hauler based out of Phoenix, AZ. We started out as a small carrier hauling bulk milk and have grown into three corporations over the years. Safety and quality service are our number one priorities! Pipho prides itself with receiving satisfactory ratings with the FMCSA. We operate only the finest equipment available. Pipho employees are dedicated and work together as a team to provide our customers with the finest service in the industry.